We would love to have you tell us and others about your experience! Love this place. Everyone is wonderful and they are winderful to my Toby and Dixie. It's been 7 long months since our Dee Dee crossed the Rainbow Bridge in their office. We adopted her when she was 8 and came to us with medical issues but we were able to enjoy 3 years of companionship with her. Dr Jeff was always so compassionate....so helpful in maintaining her quality of life....the staff was always so amazing....so kind and understanding with our many needs and appointments. We moved to GJ a few months before she passed but we kept doctoring with Surface Creek Veterinary Center not only because of their history with Dee Dee but because of their continuing education that kept them up to date with animal medical issues. I also felt that their diagnostic equipment was far above what is found in most rural vet clinics. But most of all because we felt like we were special friends not just clients who wrote a check at the end of the visit....we felt understood and well cared for with the issues we were dealing with. The day she crossed over the Rainbow Bridge was very bitter sweet.....we knew it was time to end our little girls pain and we honestly didn't know how we could walk out without her. But Dr Jeff knew how hard it would be and he went out of his way to make it as easy as possible for us. She passed over the Rainbow Bridge so peacefully....it was a beautiful experience to see her so relaxed and without any pain.. And we knew....though he never said a word....that it pained Dr Jeff to have to let her go. Compassion to the max. Our hearts are still too broken to even think of another dog....but if I were to have another one, I would still drive to Cedaredge to see Dr Jeff and Dr Suzie. Thanks for being there for us for Jazzy and Dee Dee. I met Drs. Susie and Jeff in 2012. My dog is Maggie Ann. In August of 2012, she was drinking a lot of water, stopped eating, and started to piddle around the house. It was very hot that August, and I thought it may have contributed to her condition. One Sunday in August when I got up, she was like a ragdoll. 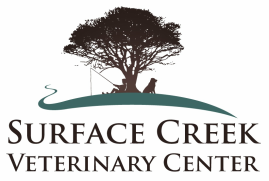 I called Surface Creek Veterinary and talked to Dr. Susie. She said to bring her in around 9:30, - and Dr. Susie immediately gave her an IV and a pain pill, and took blood. Results were everything was over the top, also said there was no guarantee thy could pull her through. She did more tests that afternoon and diagnosed diabetes. But with all the treatment, and loving care of Dr. Jeff and Dr. Susie and their great staff they saved her for me. She is now going on 11 years old and I thank God everyday for the wonderful clinic and love they have for the animals they take care of, and especially my Maggie. Best place ever to bring your loved animals. They also make house calls! Yea!!! Surface Creek vets saved our dog Buckley!.. after a totally ugly deer attack involving goring injuries to the eye and side he has fully recovered! thanks Surface Creek and the Drs. Hirsch!! It has been refreshing and reassuring to have the staff at SCVC (since they opened their doors) care for my dogs and cat. When my eight year old schnauzer was dying of cancer Dr. Jeff was very compassionate. He came to my home to put Heidi to rest. Later I rescued a basset hound who needed major dental work and other surgeries. Doc Susie was wonderful in handling to work and communicating through the process. The staff members are always helpful and a positive reflection on the clinic. I also appreciate how quickly and eagerly SCVC has participated in community programs to support animal welfare. They are a real asset to our area. I brought my dog in to have a check up. It was very very welcoming and warm. I would recommend anyone to bring there family members in. We have had two excellent experiences with out 9 year old miniature poodle Suzee. times and tried several treatment regimens and while they helped the cough persisted. peanut butter treats that she was receiving and lo and behold the problem was gone in a few days. dog was a pup she jumped off of some high objects and probably hurt her back then. their training and vast experience. That is followed by compassionate care and treatment for Suzee. We highly recommend the care of Dr's Susie and Jeff and their staff for your animals.